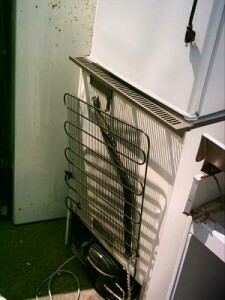 Although they are very controversial, some say they made functional ones. 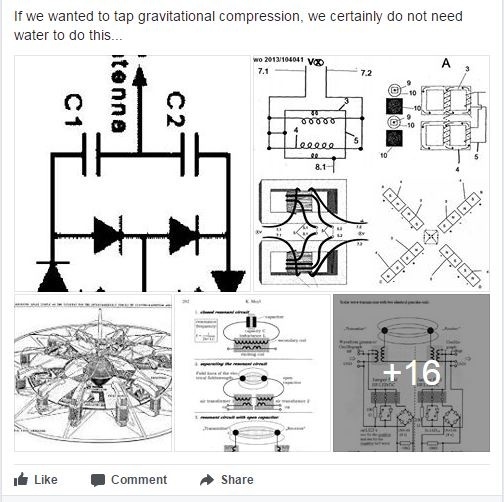 The inventor of this (unknown) or some other free energy fan has posted an explanation of how the Pinwheel Free Energy Generator might work, on a Squidoo lens. Another website I found hosted the schematics that may help one build the generator. I compiled both and put them into this article. I really don’t guarantee whether this free energy generator will work or not, but I’m eager to find anybody who tried it and their results. Gravity is one of the disputed possible sources of energy that, if harvested properly and if working, would change the way we see things – forever. 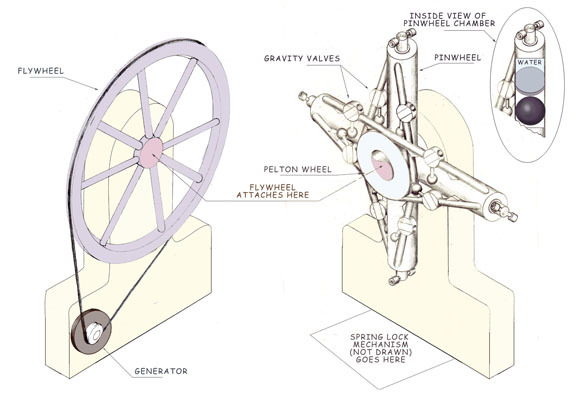 “As the weight ball in the lower cylinder descends, it forces the liquid out of the cylinder, through the Pelton wheel (turning the wheel and the generator), and into the upper cylinder. As the ball nears the bottom of the cylinder, the liquid weight of the mechanism is concentrated in the upper and right side cylinders, over-balancing the mechanism to rotate to the right when unlocked. As the ball presses down on the unlocking mechanism of the gravitational engine, it also compresses the push bar spring. If the ball weighs 60,000 lbs, the energy in the spring can equal 59,999 lbs. Once the ball unlocks the mechanism, the spring bar pushes the lower cylinder out of the stop block. This push, along with the over-balance, causes the whole mechanism to rotate 90 degrees to where the right side cylinder becomes the lower cylinder, having now its ball begin its descent-producing electricity. This process continues perpetually. An air venting pipe connects the cylinders that are opposite to each other so that as the liquid enters the top cylinder, the air it is displacing goes out the pipe and into the bottom cylinder, being assisted by the vacuum being created in the bottom cylinder by it’s ball descending. If any of you tried this experiment and it did or did not work, please comment. 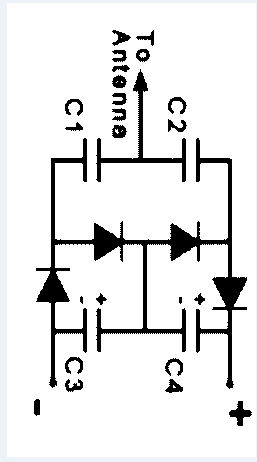 Also, if you have an opinion after seeing the schematics presented below, say your thoughts. 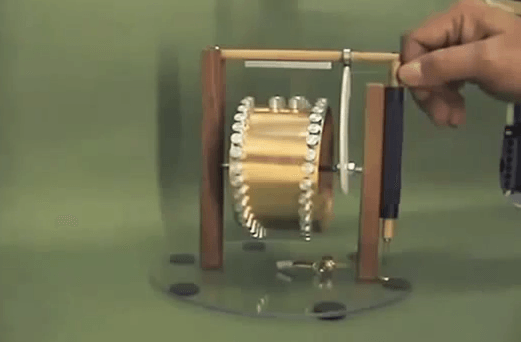 I saw video one person did PIN wheel electricity by input 10 HP and output 100KW. But unfortunately that video is not available in any website now a days. If some one has that video please send us by email. Some one help will be highly appreciated for us. The laws of physics must be strictly adhered to to prevent economic instability. We’re we to go around producing “free stuff”, life as we know it would cease to exist. The laws of physics 200 years ago clearly stated that time doesnt change as we see in time dilation… SOooo…. i guess time dilation as we take into account when launching satellites into orbit must be magic then or “”Absolute Rubbish””…lol… Cause so the “””Great Physics Laws Of 200 Years Ago Said””….lolol….. The laws of science 500 years ago clearly stated that the earth was flat…. So if you believe that the earth is round, i guess that must be “”Absolute Rubbish”” right?….. hehe .. cause the laws of science 500 years ago said so…..Hehehehe….. Ur Such a genious…..Hahaha…..
We are already moving. Putting energy into a moving system to gain momentum is insane. Perpetual motion is already happening, through the movement of our Universe, Galaxy, Solar system, Planet Molecules and atoms. 6 Phases of gyroscopic compression that is not stationary. Learning how to tap the inertia of momentum allows us to induce this into an electrical function. Our planet already does this. To ignore natural functions is insane. Eat your friggin salt dimwit. What if it was a U-shaped tube that used the pressure created by gravity alone? 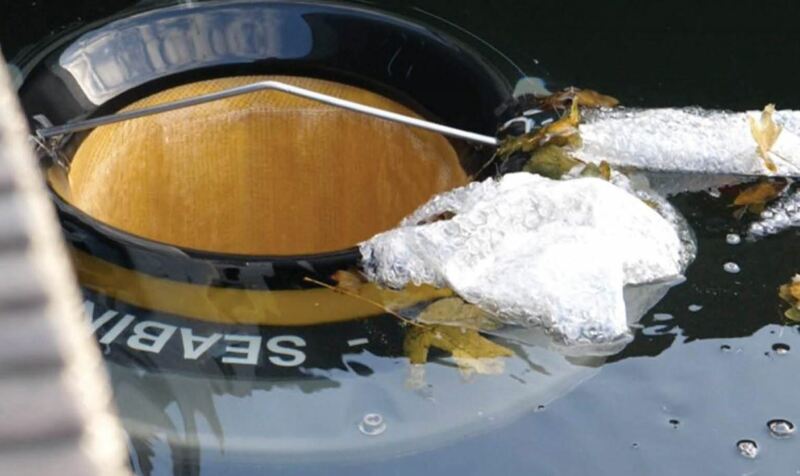 Is it possible, or has it even been accomplished, to have a free floating structure in the ocean, below the turbulent surface, that gathered water into a U-shaped tube and gathered the kinetic energy and then turned it into a power source, most likely electricity? You mean like so? 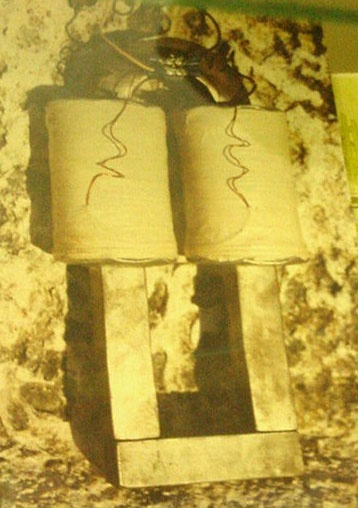 A twin co il toroidal transformer. So what? A magnetic wheel can induce both coils going in one direction…that’s all this is..done correctly. Okay…listen….you guys got this all screwed up. Anytime we split gravity we can converge it inducing a square of force reaction. 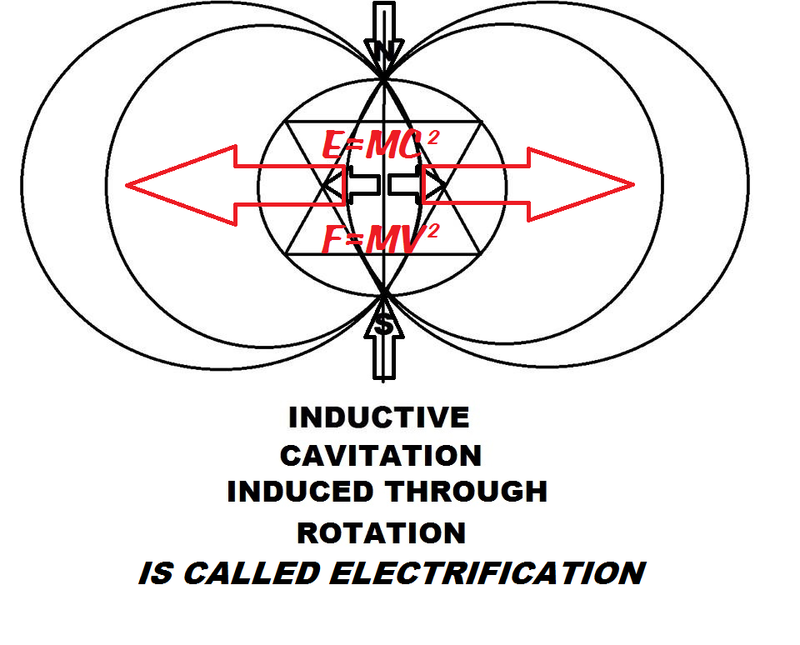 I mean really….I can lay this out into mechanical and electro- mechanical, electromagnetic, electromotive, mathematical, geometric…come on people, this is easy.I think you just need to increase your mineral content and fire your brains back uo a bit…this is not difficult. I can’t believe that people still do not understand that gravity is electricity in reverse. This was explained by Tesla in totality over 135 years ago, in 1880. Get a grip people. Learn how to induce phase conjugation by splitting a magnetic wave function. Children are doing this…maybe not near you, but those that know me have parents that are listening. Why not forget about the balls! You could simply replace the action of the ball sinking through the fluid and displacing it, with a cam on the axle and a couple of pistons! And, of course, it still wouldn’t work. i just want to know how efficient the swingarms and a wheel mechanism with variable torque is?? because I’m working on it …please help me out.. Damn!, that’s so f*cking funny, hahahaha. It’s been a long time since I’ve laughed so hard reading a comment. Thanks! @Malkana hi malkana..im from qatar…we are researching into renewable sources of energy ,infact i designed a gravtational motor for a car,but it lacks a few desin integration.i would like to be in touch with you and if we cud speak ,i have a financed research dept. from a sheikh…pls email me back on [email protected] me skype on cool7275..thx Ali. any unit larger than 100 KG would stall on the flip .. your science is lacking the 3rd axis of travel and the variable forces that make gravity . harvest the radiation that comes from the core of the earth .. think ark of the covenant … it is truly a wild card device . Also, your understanding of gravitation, movement, inertia and a core based compression through cavitation is also fundamentally unsound. It is away from the axis in any spinning field , not toward it..so please try not to sound absurd here okay? Get $14000. Read Gravity books quickly. Research unlimited dark energy. Secure an Alien Network, then bounce over to Serbia in a Sterling hybrid water car, and build a Pinwheel. @Michael Sterling did not understand your message. Can you sell a finished working engine that runs on free energy? No…get the free PJK Free energy book instead. This is what i needed to kick start an idea i had thank you i will let u guys know if it works and the how i built it. If you are interested in marketing your invention and if it really works then email me at [email protected]. We might help you in making big money. Thanks,Oren,I am still continuing my research work,we want to make a perfect Gravity engine,more compact and more efficient.The research will not stop. The right way to get things done is not to mind who has got the credit for doing them. Don’t just retire from something; have something to retire to. i have just read this page and i believe it would work but i also believe that it will not rotate fast enough to produce a significant amount of electricity. it is a very good idea but will not fulfil the future’s energy needs. 2. 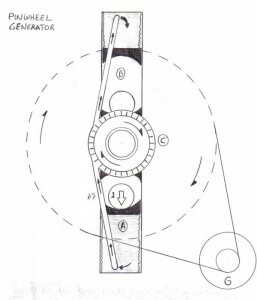 The concept of this machine running on gravity – Wont damping occur (Any amount of lubrication will not completely remove it) In a EM generator, magnetic force is much greater than the gravitational and inertial force. Here the driving force itself is gravity, unless the is complete absence of damping (impractical), how can it run the machine?? Leme know if you have an explanation. A design feature that has not been mentioned is that within the ball saddle is a spring mechanism (inverted automobile leaf spring would work) that is depressed when that cylinder is at the bottom position. 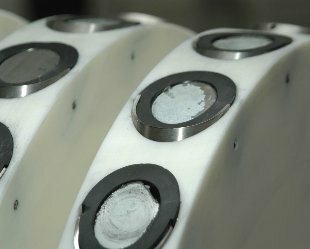 As that cylinder rotates to the left after being emptied, the leaf spring (having a push bar) pushes the weight ball away from the saddle and toward the axis where magnetic attraction can hold the ball in place. This action removes the only weight resistance to the 90 degree rotation, insuring the generator’s operation. I’m sorry but I think it is you that has missed the point of our discussion. Your statement that essentially all science is ridiculous is both ignorant and insulting. You wouldn’t be sitting there typing on a computer, communicating over the internet, in your nice heated/air conditioned home without science. Take a step back and take a bit more of your own advice before making such bold, unsubstantiated claims. …Because water does exist and gravitational potential energy is a well understood concept. The energy in the case of a dam is free as you say but by no means created from nothing. The sun provided the energy to evaporate the water (which then falls as rain) that we extract hydroelectricity from. There’s no magic going on here, the universe is a scrupulous accountant, if it weren’t devices such as those above would be solving the worlds problems by now. I think I would go for the Sun, Water and Wind to provide my “free energy”. This device could be a work of art as in a sculpture! 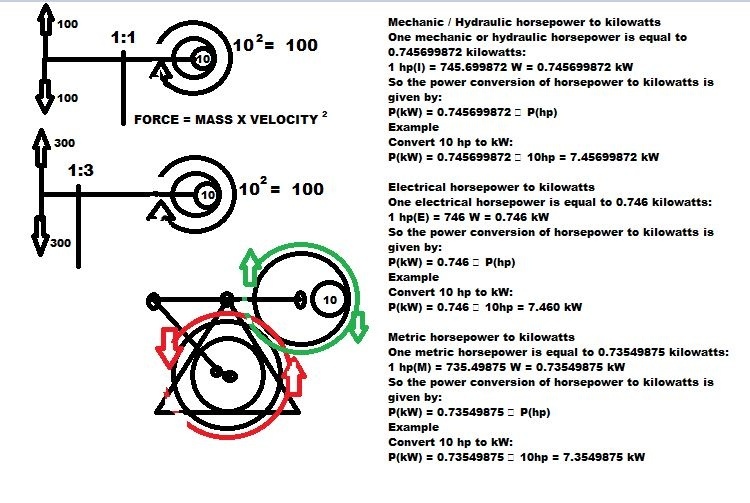 i think that can produce electricity by combination gravity and hydrolic for example inter the tube of a truck if you want to know mail to me. 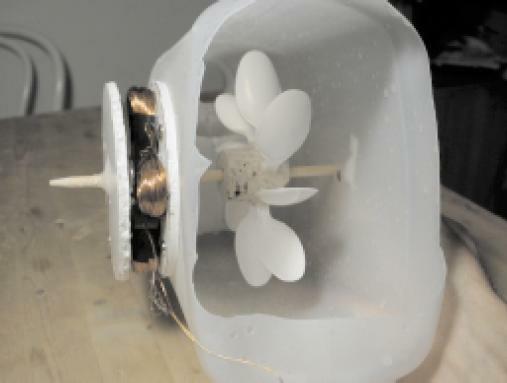 What if you used a wind-power assist to provide just the tiniest bit of guarantee to the “perpetual motion,” thus allowing an outside small power source to keep this going? 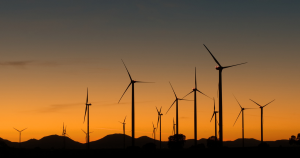 The wind power could get this going (if you have wind, which we have plenty of here in Texas) and keep it going through any slow-down of the friction-induced conditions. 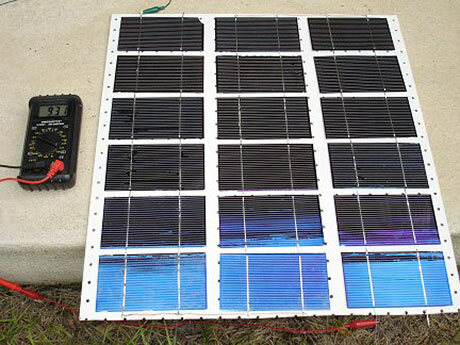 You might also consider a small assist from water flow, or even solar power, without tapping into the grid. Have built 2 gravity gen. 1 With Water, 1 with fishing weights. where can i send pic? There is a drawing of this machine posted at http://www.overunity.com Look in the forum under gravity powered devices, pinwheel generator. It is on the 2nd page of this thread. It will give an idea of what this machine would look like if it were built. As far as I know, no one has built this machine yet. Just like in freshman physics, as long as you ignore friction, it works. The US patent office banned patent applications for “perpetual motion” machines more than a hundred years ago for a reason-they can’t work.